New Orleans circa 1890. "St. Charles Hotel from Canal Street." 5x7 inch glass negative by William Henry Jackson. View full size. Submitted by PBG on Wed, 03/27/2019 - 12:21pm. There are some cities (in know Lisbon and Linz) that used special gauges in order to avoid carriage traffic on their tracks. This photo shows the reason quite well as the gig is just rerailed. Submitted by ajlcary on Tue, 03/19/2019 - 2:55pm. Horse powered omnibuses (called horsecars) were very common in the 19th century. The problem with horsecars was the horses. Specifically horse manure and urine. Horses could also panic, dragging the horsecar after them. Most cities (including New Orleans) tried replacing horsecars with different solutions: ammonia engines, steam "dummies" (effectively a small steam engine inside a converted horsecar), battery powered cars, cable cars. Eventually electric overhead powered streetcars using trolleys became the norm. 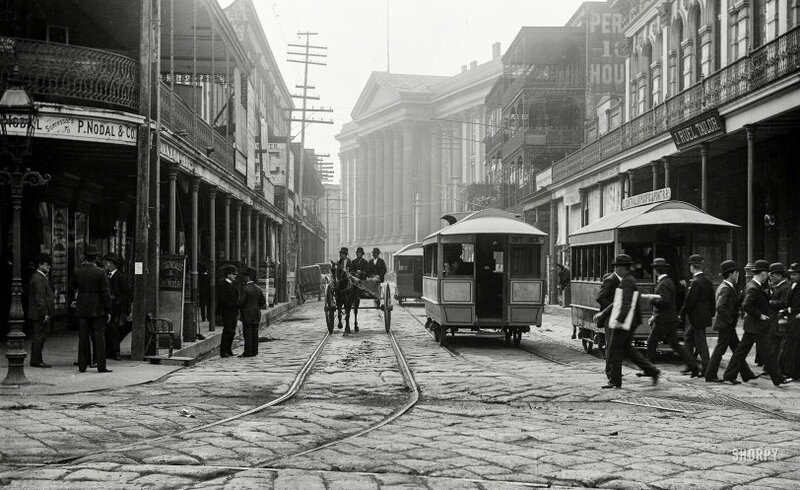 In New Orleans, horsecars were replaced by overhead powered electric streetcars starting in 1893. A few cities still have streetcars (San Francisco), but buses pretty much replaced them by the 1960s. Submitted by Vonderbees on Mon, 03/18/2019 - 8:02am. Those streetcars have some real horsepower!